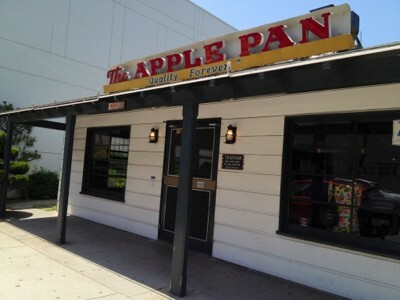 The Apple Pan is a legendary burger joint in West Los Angeles. It has a cult-like following and is busy all hours of the day and night. The place looks exactly the same as it did when it opened in 1947– including its cottage exterior. 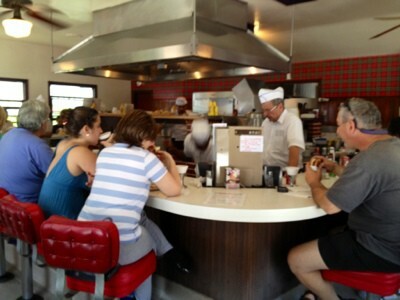 It’s a blast back in time with its counter-only seating, red leather stools, open kitchen with flat-top griddle, and waiters with paper hats. Apple Pan is family-owned and now run by a second generation. They have one location and have turned down many offers to expand, franchise or sell their prime property. 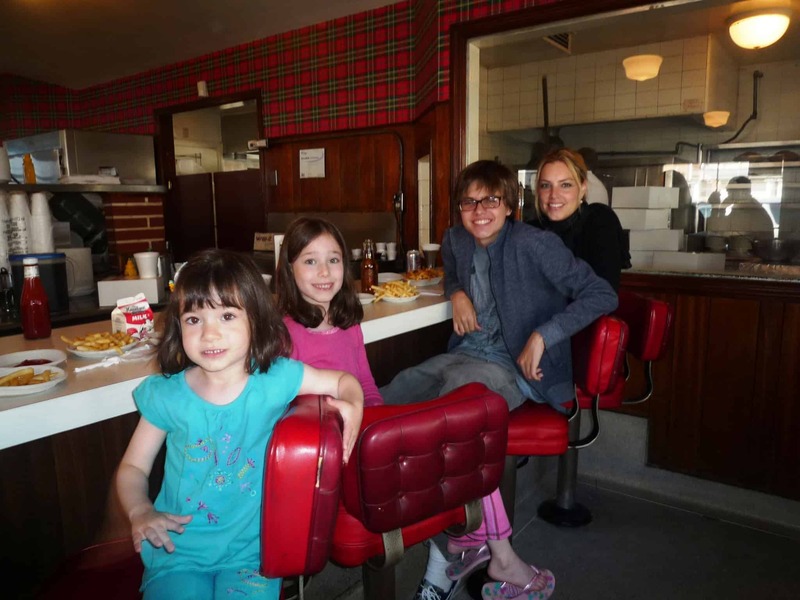 What I love about Apple Pan is that it is a piece of LA history, and many people have their own personal stories to tell. My dad loved Apple Pan, and he had a funny story he told about it. He claimed that one time when he arrived at the Apple Pan, his good friend Jerry was already there eating, but Jerry did not notice that my father had walked in. Jerry was a big practical joker, and my father liked to reciprocate. The story goes that Jerry was holding up his hamburger, and that my father walked up behind Jerry’s counter stool and leaned over Jerry’s shoulder and surprised him by taking a bite of his hamburger. There are doubters, but my father swore that this is a true story. I remember going to Apple Pan with my parents and sister when we were kids. Now my sister and I take our kids. One time I even strapped my daughter’s high chair to a stool. That was a funny sight. Unfortunately, I don’t have a photo with the portable high chair because that was from the pre-camera phone era. 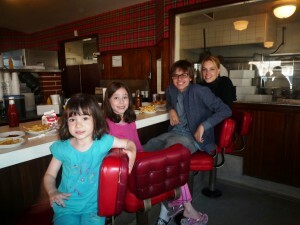 Here’s a more recent photo of my sister and me with our kids at the Apple Pan. 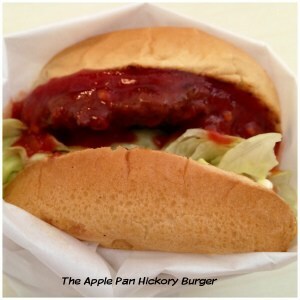 What I like best about the Apple Pan is the hickory burger. The special sauce is the best sauce I have ever had on a burger. It’s a unique cross between a barbecue sauce and ketchup, and there’s nothing like it in the supermarket. So, I decided to try to duplicate their sauce at home. I did an Internet search to see if anyone leaked the recipe but came up empty-handed. I even tried to ask the Apple Pan for the recipe after I felt encouraged by Adam Robert’s Amateur Gourmet blog post where he scored a restaurant recipe. Anyway, I had no luck obtaining the recipe from the source. I learned that every Apple Pan employee has to sign a confidentiality agreement and cannot reveal any recipes. This sauce is a well-kept secret. 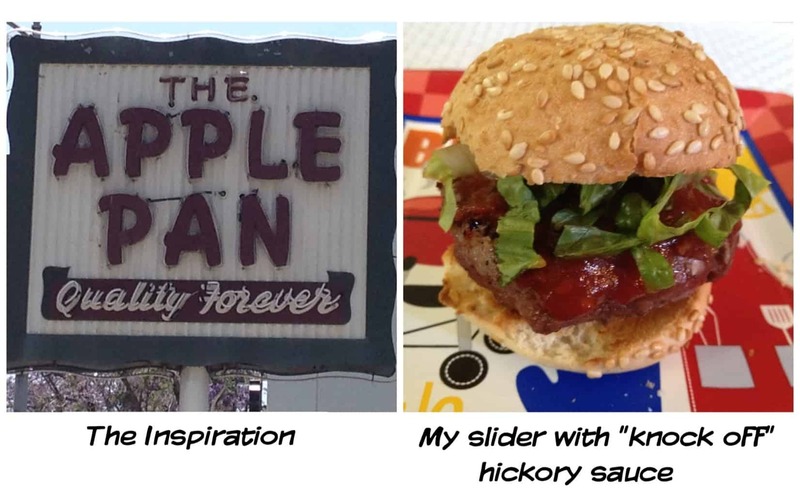 So, I had to go it alone and come up with my own “knock-off” Apple Pan hickory sauce. One taste of the hickory burger, and it’s evident that there’s a hickory flavor and some sort of tomato sauce. Early on I decided the recipe includes liquid smoke and chili sauce, but I think there’s more to it. I’ve been in the kitchen tinkering on several occasions, and my family and friends have been taste-testers. Actually, all versions have received positive reviews. Finally, I arrived at my final version of the recipe and felt pleased. Then, I happened to taste one more Apple Pan hickory burger and discovered an unexpected secret. My friend brought me a “to-go” burger with the sauce on the side. I tasted the burger and the sauce separately for the first time. Much to my surprise, the hickory flavor appears to be in the meat and not in the sauce. What a shocking revelation. For decades I always thought of the sauce as being a hickory sauce, but it’s not. The meat most likely contains liquid smoke. As a huge hickory burger fan, I remain in shock as my long-standing assumption is shattered. My finding was verified the next day when I returned to the Apple Pan to take some photos for this post. I chatted with a friendly, frequent diner named Will who said that he noticed that the meat patties seem to be kept in two different piles. He said that when he orders a steak burger instead of a hickory burger, the meat patty comes from a different pile. Being a twice-a-week diner makes Will an expert in my book, and he concurred with my conclusion. Well, this late-breaking discovery presented me with a dilemma: should I continue to put the hickory flavor in the sauce or should I switch it to the meat like the Apple Pan evidently does? I decided that I really like my version of the hickory barbecue sauce and have been enjoying it on the sliders I’ve been making. So, the hickory remains in the sauce. 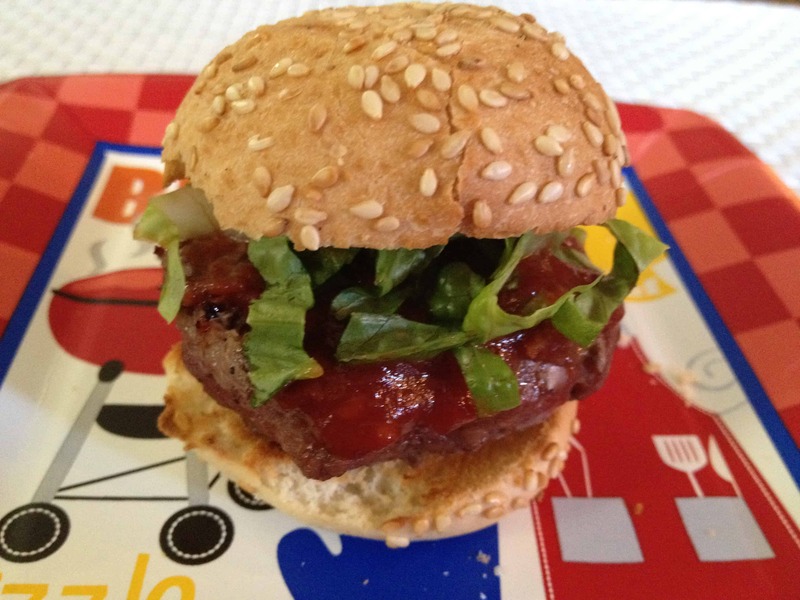 My “knock-off” sauce turns an ordinary burger into one with all the sensational flavor of an Apple Pan hickory burger. 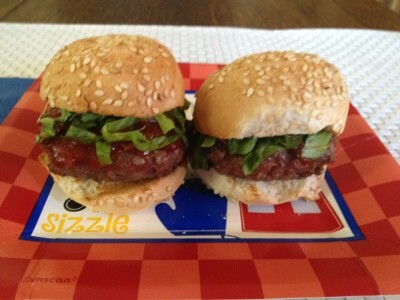 I like to put my hickory sauce on “sliders,” which are mini beef hamburgers. Lately, we have been getting grass-fed ground beef from the farmers’ markets. The grass-fed beef tastes “cleaner” than regular beef. 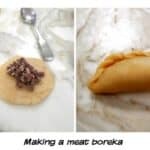 It is more flavorful without being greasy or fatty. This meat only needs a little salt and pepper before it’s grilled. We have enjoyed meat from Rocky Canyon Farm (at the Santa Monica Farmers’ Market on Wednesdays and Saturdays and in Hollywood on Sundays). We also like the grass-fed beef from Dey Dey’s Best Beef Ever. In addition, mini burgers need mini buns. So far I have found mini buns at Trader Joe’s and Rockenwagner Bakery (Santa Monica, Venice and Culver City). I think it’s fun to serve the sliders with a toppings bar. 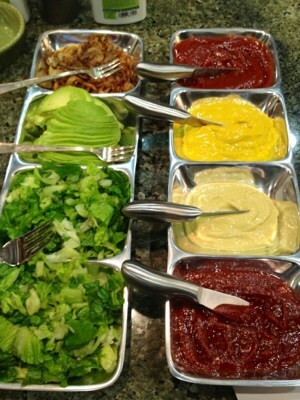 My favorite toppings are hickory sauce, sautéed onions, avocado and shredded lettuce. My condiment bar also includes ketchup, yellow mustard, and Dijon mustard. Oh, and one more thing about the Apple Pan: their pies are amazing. I especially like apple, chocolate, and banana cream. You can even buy their apple pie unbaked, and they send you home with printed baking instructions. I did that last Thanksgiving, and the whole house smelled like cinnamon and warm apples. Yum. 1. Mix all ingredients in a small bowl. Serve as a sauce for beef sliders. The condiment bar is like what they had at Woody’s Smorgasburger. It was a chain when i was a kid in the late 50’s/early 60’s, last one by LAX went out of business in the early 90’s. They had a whole bar of different toppings for their burgers, the one that I thought was odd was chopped peanuts. They had a similar bar for dessert, they had soft serve ice cream machine with a bar full of ice cream toppings. First place I eve had a char broiled burger, I can still taste them, so delicious! Yessss!! I went to Woody’s back in the day. In fact, I had one of my childhood birthday parties there. Such great memories. Thanks for sharing. Spot-ON! The Hickory sauce is very close if not bloody identical. I am a vegetarian, however I have been to Apple Pan and had the Hickory Burger long ago when I was not. I make the sauce for the Gardein Meatless Patties. And I have to say it is delicious. I made my own vegetarian chili sauce. 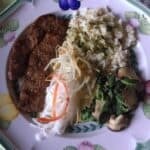 Thank you for the reply and for letting me know my recipe is a good “knock-off.” I think the sauce is a wonderful accompaniment to a veggie burger– the sauce lends an authentic burger taste. Great idea. Hi Debbie, thanks for reading my blog. Now you can have the Apple Pan flavor at home. I think we’ll be near you this summer, so we’ll catch up. Dana – I LOVE THIS POST. Thank you for sharing family history and the history of Apple Pan. I love these burgers too. And, I love your slider bar – it’s a great idea – I may have to steal it. Here’s a question for you – do you know any good sugar free Hickory Sauce – or very low low sugar for those who love bbq sauce but don’t want the high sugar content or additives that come in ketchup and chili sauce? You actually gave me an idea – use one of the sugar free BBQ sauces I have (from Whole Foods) and add hickory smoke into it. It’s very watery sauce, but atleast maybe the flavor will be more like regular sauce. Any other suggestions? I actually have tried a lot of sugar free BBQ sauces, but they all do not taste very good. Hi Michele- great question. I would do one of two things to adapt this recipe to be sugar- free. 1) you could start with a sugar-free/low sugar ketchup– see some choices at http://www.ketchupworld.com/low-carb-sugar-free-ketchup. Then add in liquid smoke for the hickory flavor, and add in few additional spices similar to chili sauce like pickling spice, sweet chili powder, cinnamon or allspice. 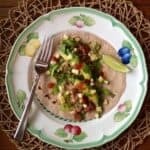 2) Another option is to make your own homemade chili sauce like the one at http://www.food.com/recipe/low-carb-chili-sauce-385291. Then just add in some liquid smoke. If you use naturally sweet ingredients like peak season tomatoes and sweet pepper, you won’t miss the sugar as much. Depending on your specific needs, you could add in a little artificial sweetener or Stevia. Hope this helps. I live in in Texas and have never been to Apple Pan. I did, however, see it featured on a food show (Food Network or Travel Channel.) 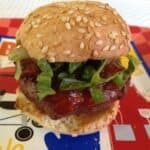 I have been searching for a good “hickory smoke sauce” recipe, There is a place here in Austin of the same early-50’s vintage that is incredible — The Top Notch. http://topnotchaustin.com/ Probably pretty similar. I would not have thought of the chili sauce. I am going to try tomorrow. Hey. 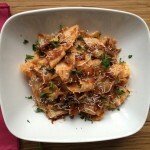 Charles- hope you enjoy this recipe as much as you like Top Notch. I’ll have to check it out if I travel that way.